As is usual for a Tuesday, we meet at Pitstone Roundabout to depart at 6:30pm. Sticking with our ‘three ride Sunday’ formula, our early adventure this week takes us past Cranfield Airport. As always, we meet at the Rose & Crown 10 minutes before the start time and please bring a copy of your chosen route in either digital (Garmin) or analogue (Paper) formats. Hot on the heels of the amazing Martin Sisley who raised over £3,000 for the Air Ambulance Service last week, Dave Bembridge is planning to ride from John O’Groats to Lands End starting on the 12th July. The knowledgeable ones amongst you will have spotted that, unlike Martin who rode ‘up’ the country to John O’Groats, Dave’s journey is essentially down hill all the way. To make up for this, Dave is adding a few miles just to make it that much tougher for him. In fact, his route includes 1,500 miles of cycling. No mean feat and all to raise money for a fantastic cause, Cancer Research. Dave does a lot for our club – and cycling in general, so please do sponsor him if you can. He is also inviting his fellow velos to join him on the various legs – if you are interested then please have a chat with him. 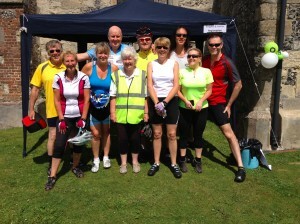 Also undertaking a challenge is Angela Hollands, who is riding the Herts Cycle Challenge on Sunday 6th July. She would love some company if anyone fancies giving this one a go. Starting in St Albans, there are two circular routes to choose from – 25 miles or 50 miles. All the details, routes and the registration info can be found here on the Rennie Grove Hospice website. The Tea Ride. As fast as the slowest rider and We Stick Together. 10am, Saturdays, The Rose & Crown. Now that England have confirmed their flight home from Brazil, going out cycling this Tuesday seems like a really good idea. We have something a bit different planned for those who fancy trying something new. Richard (from the Bossard Wheelers) has suggested we try developing our group riding with a couple of laps of the of the Mentmore TT circuit. It will give us an opportunity to work on our chain gang skills and might result in some interesting average speeds. If you would like a more usual Tuesday evening ride, we have a flat 25 miler that includes some of the TT route so you can wave hello as you speed past them. Both of these groups will be gathering at Pitstone roundabout with a view to depart at 6:30pm. The forecast is fantastic as are the routes we have on offer for this Sunday. Once again, our Routemaster General, Dave “The Hill” Howe has put them together. We are a little concerned that he is mellowing recently as these are positively flat. This probably is only a temporary thing though so please, grab them while you can. First up is a great route on some new roads for us. It is 62 miles in length and really is just about a flat a route you can get for that distance (round here at least). We start at 9am for this one which Dave will be leading, and 10am for the other two – a 40 mile adventure (which links up with the longer ride towards the end) and a 30 miler. Now, if any of your are sitting there thinking, flipping heck, these are really long – just stop for a second and have a moment to consider what our own Martin Sisley is doing right now. Add the fact that the weather is great at the moment and you have the perfect recipe for getting out there on your bike. The Tea Ride. Every cyclist’s midsummer dream. (As long as it’s the countryside, tea and cake anyway). 10am, The Rose & Crown, Ivinghoe. Both rides start from the Pitstone Roundabout at 6:30pm sharp. So the Hegs’ are away and its time for more Sunday cycling fun!! “I wanted to thank everyone for your generous contributions. Our original target was £2000 – already we are through £2500, with a little bit of luck we might even be able to make £3000, which would be fantastic. I will also do my best to update Strava each day – but that will depend on when and where I can blag access to a computer! Guess Who’s in Charge This Week Then! And everybody knew ya didn’t give no lip to Big Dave. And when he speaks to you, you should at least say “Hi” to Big Dave. where Tea & Cake is the talk of the town…..
A fairly flat Tuesday evening route for anyone looking to enjoy this great weather. We start from Pitstone Roundabout at 6:30pm.